Sally is passionate about horses and they have always been a very big part of her life. 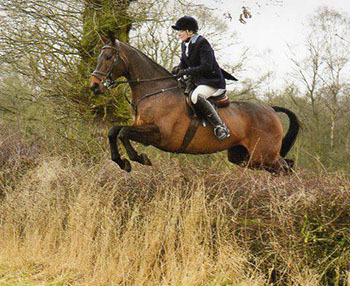 Hunting is her first love and she is an active member of the Cheshire Forest Hunt. Her daughters have evented in the past and she loves the challenge of combining three very different phases, stringing them all together on one day to the best of her horse’s abilities. Sally says: “This is the first time I have owned horses living away from home – it is a bit like sending your child to boarding school! At first it was very daunting, but the obvious choice for me was Jeanette. Jeanette has years of experience and knowledge and is without doubt very professional. After watching her for years I was thrilled to hear that she would ride my horses. Jeanette is very easy to talk to, and friendly, which put me at ease straight away. I immediately felt comfortable on the yard and with leaving my horses in Team Brakewell’s very capable hands. In my opinion Jeanette can bring out the best in a horse no matter what age, breed or size, and not many riders have this in-built talent.